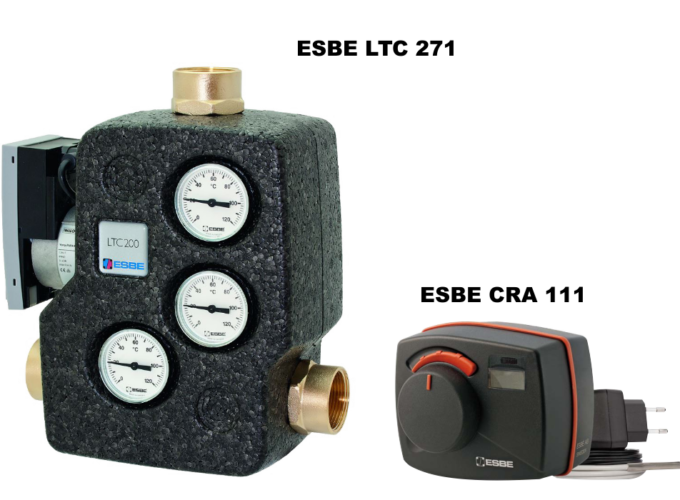 The ESBE LTC 261 and 271 3-way thermostatic valves are designed to be used with the solid fuel firing central heating systems (Bio-Tec, BioTec-L, BioTec-Plus, BioSolid, EKO-CK P, EKO-CKB P, CentroPlus, -/B) and CAS accumulation tanks in order to protect boilers from condensation of flue exhaust gases. ESBE VTC 261 and 271 valves enable operating temperature to be reached very quickly and subsequently to be maintained, by regulating the flow between the boiler’s outlet to the central heating system and a return connection directly back to the boiler, by maintaining the return line always over 60°C. There is built-in circulation pump, thermostatic valve (60°C), stop valves and thermometers. ESBE CRA 111/121 is a motor actuator with a controller for maintaining a constant return flow temperature (must be set at 60°C), which is intended for installation on 3way mixing valves from DN50 to DN150. They are designed for installation with bigger boilers (71-580 kW). They are designed to be built into central heating systems with solid fuel firing boilers together with the CAS water accumulators. The set temperature is min. 60°C (ESBE LTC 261, 271/CRA 111/121 to be set to 60°C) which protects the boiler from condensation. If the boiler temperature is below 60°C the circulation pump turns the water back from the outlet to the inlet through the unit/valve. At LTC 261 and 271 units a circulation pump is also built in as well as three stop valves and control thermometers, one for each line. Their compact construction is space saving and fitting and maintenance is very easy. 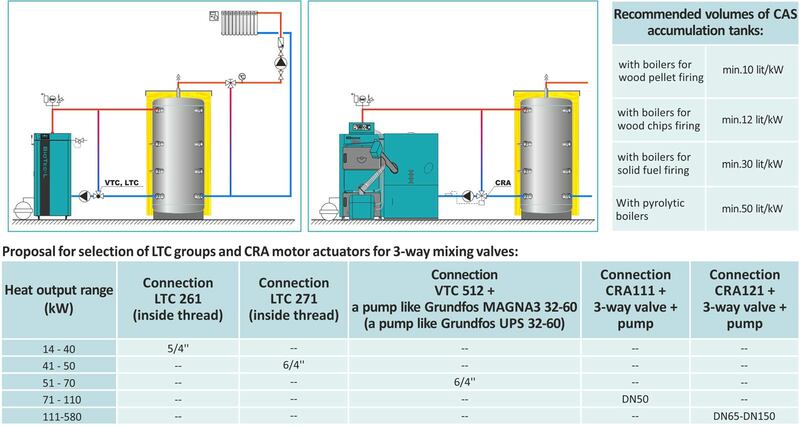 Motor actuators with controllers CRA 111/121 must be set on 60°C, must be mounted on 3way mixing valves and requires adequate circulation pump. CRA 111 are intended for 3way mixing valves up to DN50. They are supplied with transformer (230V) and a return flow temperature sensor. CRA121 are intended for 3way mixing valves from DN65 to DN150. They are delivered with a detachable controller with a screen, transformer (230V) and a return flow temperature sensor.